shooting in Cleveland in 2014. Cleveland’s filmography just keeps growing. And now word comes that Ghostbusters 3 will shoot in the Midwest Movie Belt city in 2014. The possible sequel is a follow-up to the 1984 hit and it’s more cartoon-like 1989 follow-up. 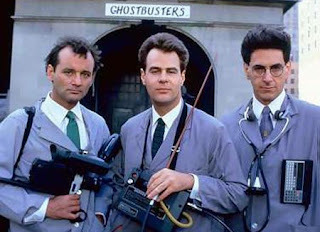 The new film reportedly will see the original Ghostbusters – sans Bill Murray – training a new group of paranormal investigators. Recent rumors suggest that will include Jonah Hill and Emma Stone. Ghostbusters 3 would be the first big budget film to hit Cleveland in 2014 that we know about right now. The city saw several films and various scales shoot among its buildings and ‘burgs in 2013, including Captain America: The Winter Soldier, Draft Day, Miss Meadows, Bad Grandpa and the currently shooting Jenny’s Wedding. Ivan Schwarz, president of the Greater Cleveland Film Commission, could neither confirm nor deny the news. Sony Pictures Entertainment's Charles Sipkin also said it was premature to say where or when Ghostbusters will film. Either way, if the filmmakers are still looking for some ideas, we like this idea from a couple years ago (okay, we wrote it, you caught us).